The liver uses vitamin K to synthesize blood-clotting proteins. Without vitamin K, the level of the blood-clotting proteins drops, and clotting time is prolonged. Vitamin K is important to help support proper coagulation (blood clotting). Vitamin K has also been recognized for its role in helping maintain the health of bones. Vitamin K is found in dark leafy greens, most green plants, alfalfa and kelp. Animal sources include liver, milk, yoghurt, egg yolks and fish liver oils. As a food supplement for adults, take one (1) vegetable capsule daily, preferably at mealtime, or as directed by a healthcare practitioner. Do not exceed directions for use. dicalcium phosphate, vegetable magnesium stearate, silicon dioxide, cellulose gum. Vegetable capsule shell: hydroxypropylmethyl cellulose. 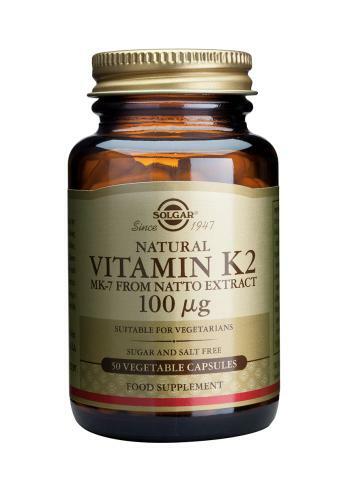 Solgar Vitamin K2 100mcg is not suitable for Vegans. All forms of Vitamin K may interact with blood thinning medications. If you are taking such medicines please consult with your healthcare practitioner before taking this product. If you are pregnant, nursing, taking any medication or have a medical condition, please consult your healthcare practitioner before taking this product. Food supplements should not be used instead of a varied diet. Keep out of reach of children.